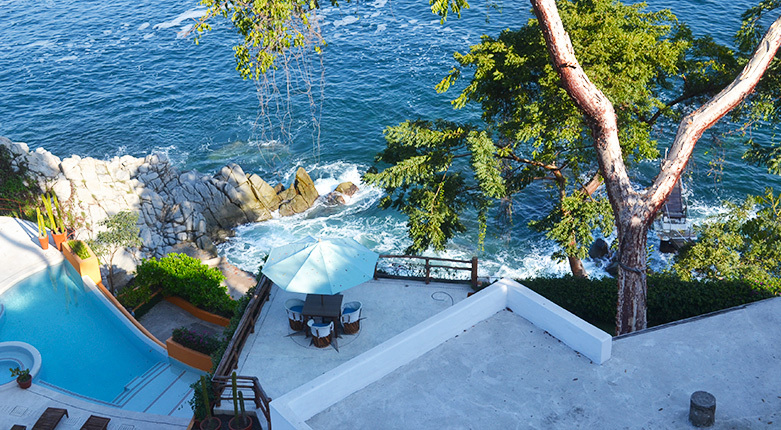 Take a short, scenic drive south from downtown Puerto Vallarta and past Mismaloya beach, and you will reach Villa Mandarinas, a colorful and extensive luxury estate. Its location, secluded yet close to the comforts of Vallarta; size, with 11 bedrooms and two pools; and views are enticing enough, but once there it’s hard not to be charmed by the allure of every detail in the house. 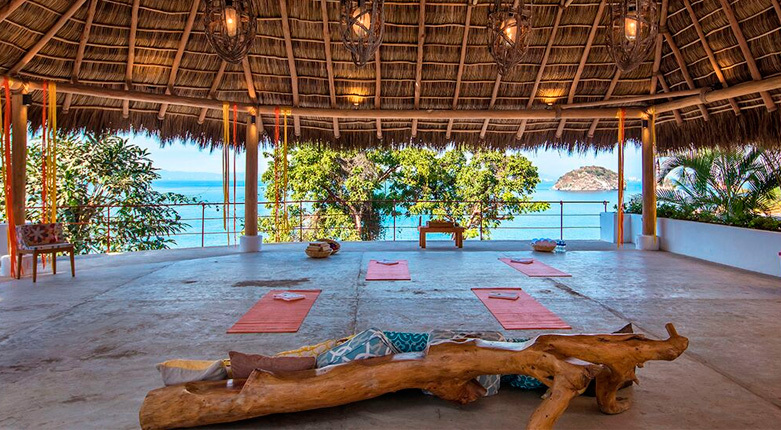 Not for nothing was this Mexican villa chosen as one of the best villas in the world during an Architectural Digest Open Audition. 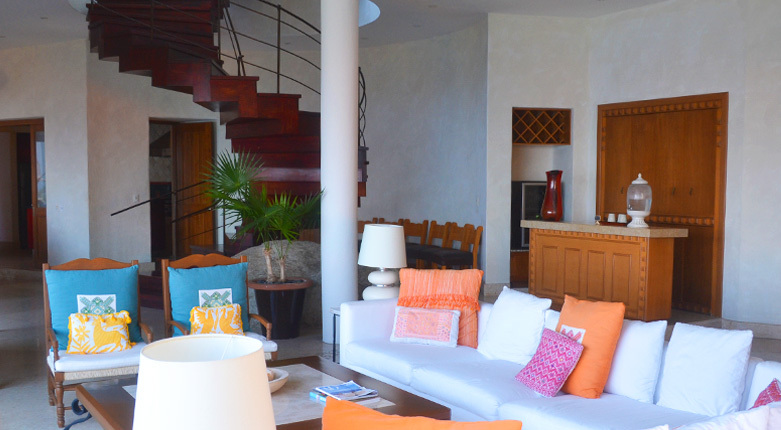 The following photos let you in on what makes Villa Mandarinas an exceptional house. Let your mind wander and imagine the fabulous holiday you can spend at this gorgeous oceanfront property. In the past, guests have arranged to arrive to Villa Mandarinas by boat, setting the tone for an equally adventurous and relaxing holiday. After your flight lands, head to the marina and board a yacht that will take you along Banderas Bay. 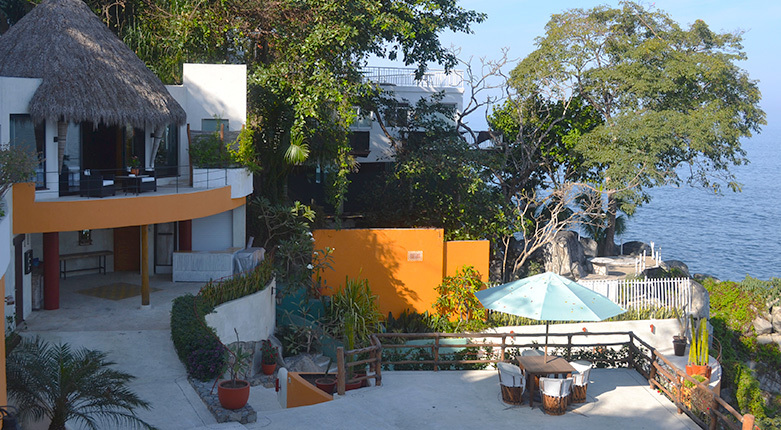 Enjoy amazing views of Puerto Vallarta as you approach the villa. Once you’re close, take a short panga ride to the villa’s dock. 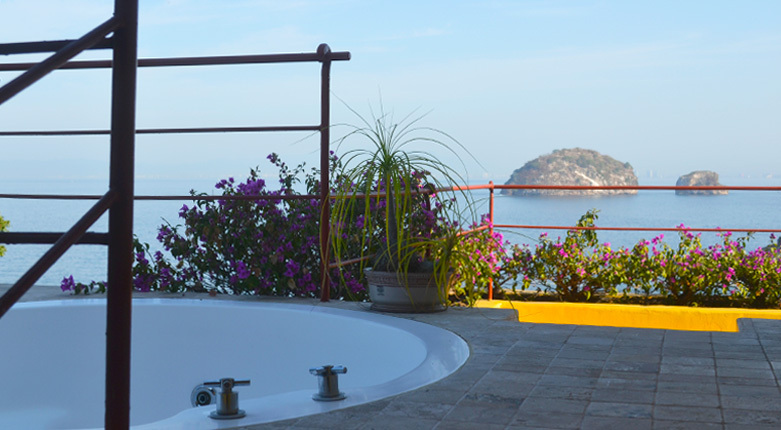 The villa’s Sand Room boasts its own private terrace with an outdoor jacuzzi tub. 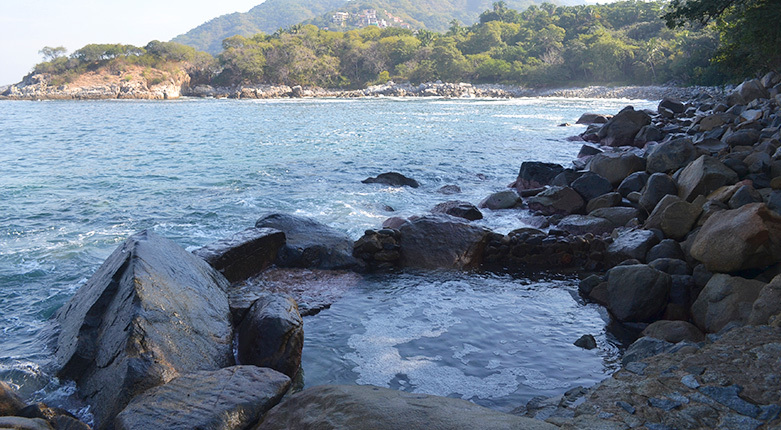 Enjoy the views of Banderas Bay and Puerto Vallarta as you relax after a day of exploring. 3. Is that a boulder in the living room? Other residences in cliff-like areas are built so that they stay level, using enormous beams for support. One of the things that sets Villa Mandarinas apart is that it was built “downward,” being adjusted to the shape of the terrain. 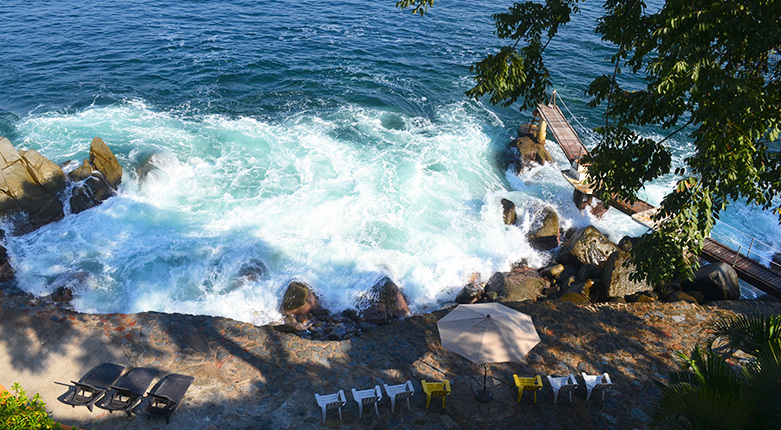 The villa gradually descends toward the ocean, making the sea your front yard. One of several surprises at Villa Mandarinas is a small ocean pool, perfect for children to safely enjoy the sea— or for adults who just want to relax with the rhythm of the tide. Picture it: you get up right before dawn and begin your day with a session of yoga. Breathe in the morning air as the sunlight starts to fill the bay. Villa Mandarinas recently expanded with the addition of the Casita Mandarinas section. This means two new master bedrooms (which brings it to a total of 11 rooms) and more terrace space, thus making Villa Mandarinas perfect for a family event, a party, or a destination wedding. Indeed, the privacy and exquisiteness of the Black Master Room make it an ideal honeymooners suite. Whether you want to have a few drinks with your friends during a game of pool, or leave the kids to play foosball and pool while you relax— you will love Villa Mandarinas’ playroom. 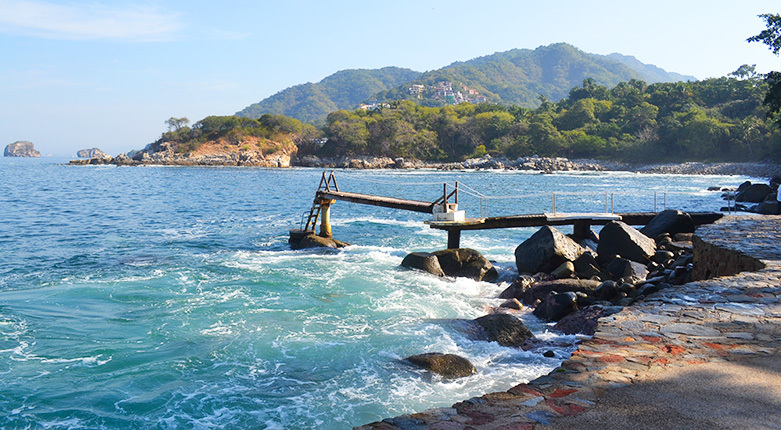 Mornings and nights can be a little chilly in Puerto Vallarta during winter. Get warm in front of the fire pit next to that special someone as you both look at the stars and listen to the ocean waves. 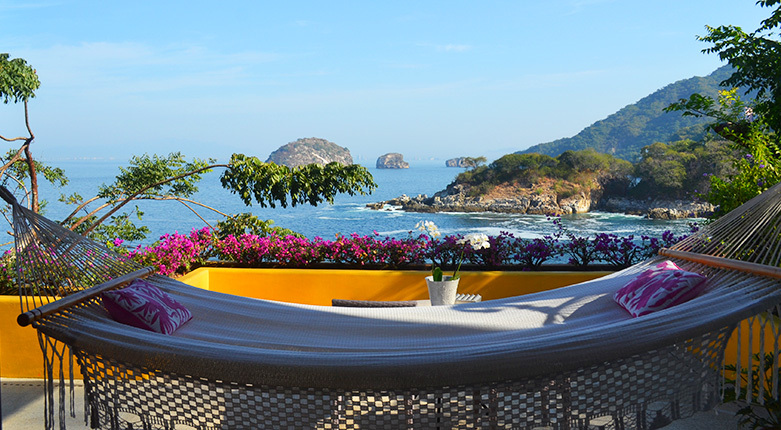 Everything in Villa Mandarinas makes it easy to relax, but the hammocks in the exterior areas and in the rooms invite you to lay down, relax, and bask in the views or take a nap. It doesn’t matter where you are in the house, you’ll want to drop everything and get on one. Remember that destination wedding we mentioned? 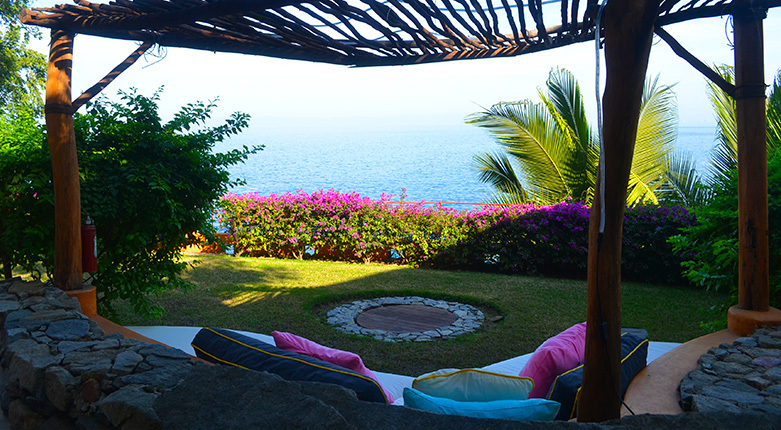 The stretch of terrace in front of the sea is where couples have their ceremony, right next to the sea. The terrace also features a wet bar, in case you just want to chill with your friends or have a drink while you sunbathe. 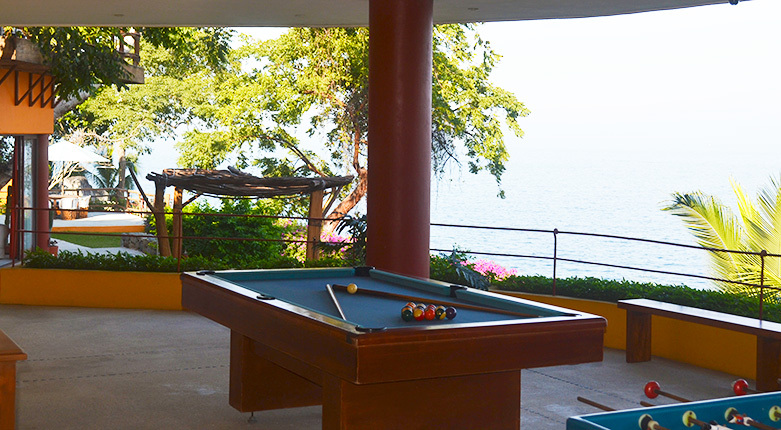 In addition to the comfort and amenities at Villa Mandarinas, there are many activities in Puerto Vallarta that can make your holiday memorable. Villas by Journey Mexico can help you plan a custom-made itinerary with active adventures, cultural encounters, or intense relaxation. With Villas by Journey Mexico you know you can count on 24/7 support and the expertise of Journey Mexico to create and deliver an unforgettable holiday. If you want to see more great photos of Villa Mandarinas, take a look at our gallery.